This was the 8th running of the Newcastle Air Show presented by Champ Marketing. On the drive up from Durban we wondered if the event would take place. At 8 am and 20 minutes from the airport, the sky was grey and overcast and there were massive low-level rain clouds. On arrival however, the sky was miraculously clear (as forecast), and the weather remained perfect all day with blue skies and little wind. 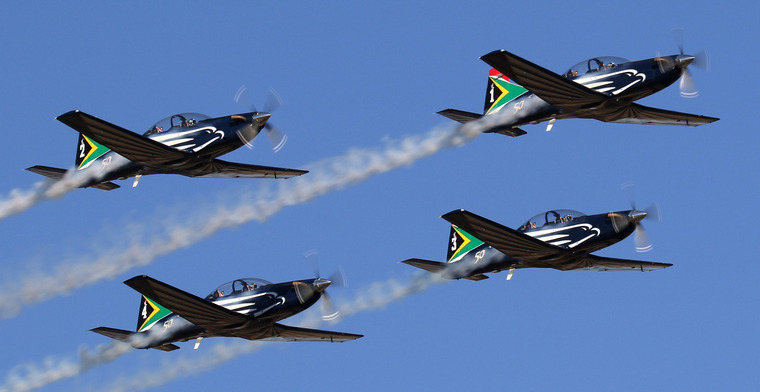 This air show is now sadly the only one held in KwaZulu Natal. 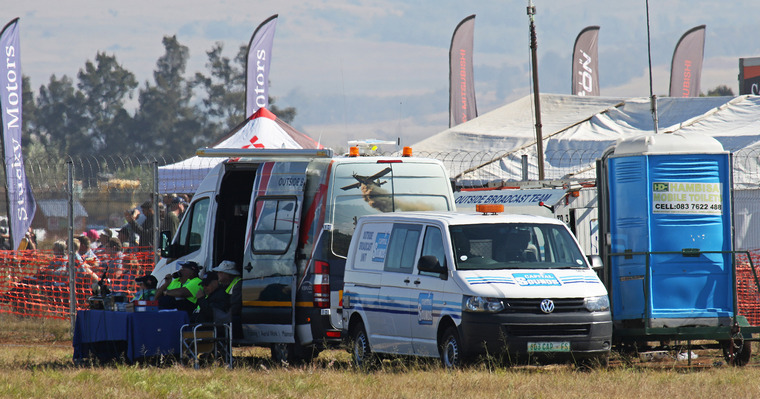 It has always been a good one and it is amazing that the organisers, Johan Pieters, Christo van der Vyver and their team, have been able to attract top quality participants in the event. It is perhaps a lesson to some larger centres that have been unable to replicate the formula. It is also a very affordable event in present economic times, with the entrance fees the same as last year, a low R50 for adults, R30 for high school children and R10 for primary school children. So really and truly a family event. 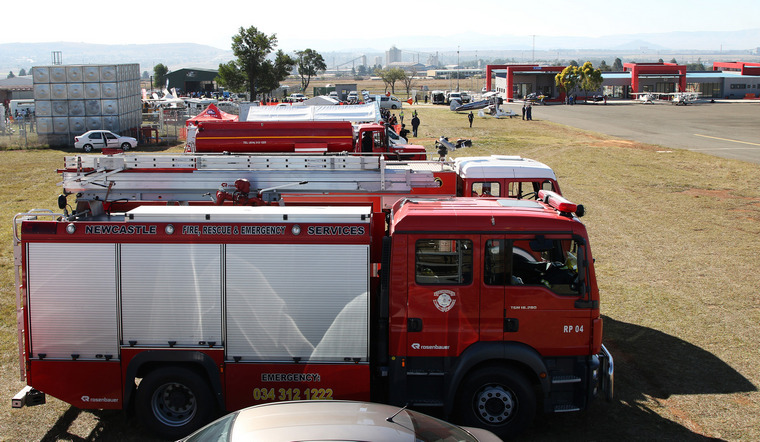 In addition to the air show itself there were exhibitions, entertainment, a fun fair, helicopter flips, a motor vehicle exhibition as well as many food stalls and a beer garden. Gates opened at 8am and there was already a large number of vehicles queued up to get in. The show was scheduled to start at 10 am and end at 4pm and it ran to clockwork schedule. It was hoped the impressive new terminal would be open in time for the show but although almost complete there some finishing touches that need to happen. The whole perimeter of the airfield has now been secured by a substantial fence. Emergency service vehicles at the ready but thankfully not needed. 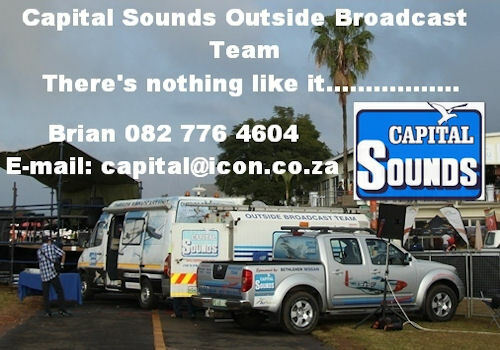 Commentary was provided as usual by Capital Sounds with Brian Emmenis on the microphone. Eagle Air Aviation provided hospitality to all pilots, crews, officials and helpers in the beautifully decorated hangar. This was the best layout I have seen at an air show of this size and thanks and congratulations should go to Percy Rudman and his team on site. The ATNS staff on duty were Benji Phukunje (ATC Lanseria), Dili Mkwanazi (ATC Rand) and Kuda Gwanzura (ATC Durban). Also, in the tower was SAAF Air Show Planner Major Lon� Nel. Three scheduled displays, including the Bell 407 of Menno Parsons, could take part for various technical reasons but this did not detract unduly from the event. A notable first at the air show was the all new management team. For the first time the top three officials were all from KwaZulu Natal! The Flight Display Director was Pete Graham, the Flight Display Safety Officer was John Neilon and the Ramp Controller was Craig Elliott of Newcastle. It was Craig's first air show in this position and he managed admirably. First display of the day was a parachute drop from a 15 squadron Oryx by the Golden Eagles parachute display team. 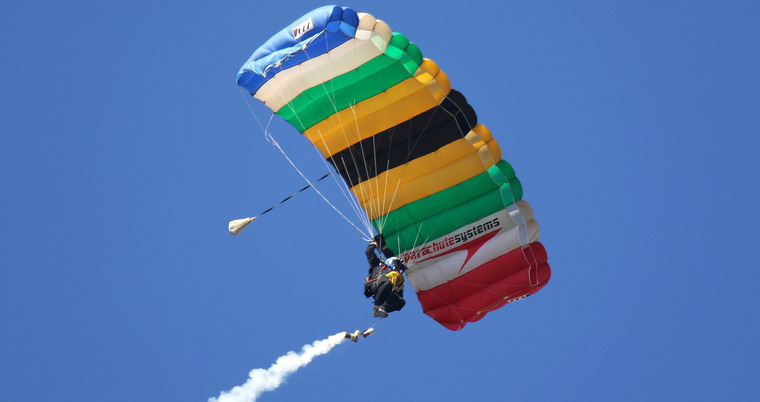 The jumpers used new colourful canopies in the SA flag colours and landed with pin point accuracy, on the mark, in front of the crowd. 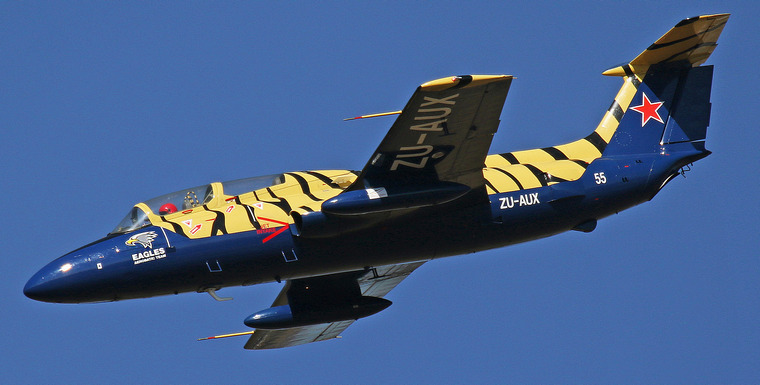 Glen Warden was next, flying the former Sasol Tigers' Aero L29 Delfin. 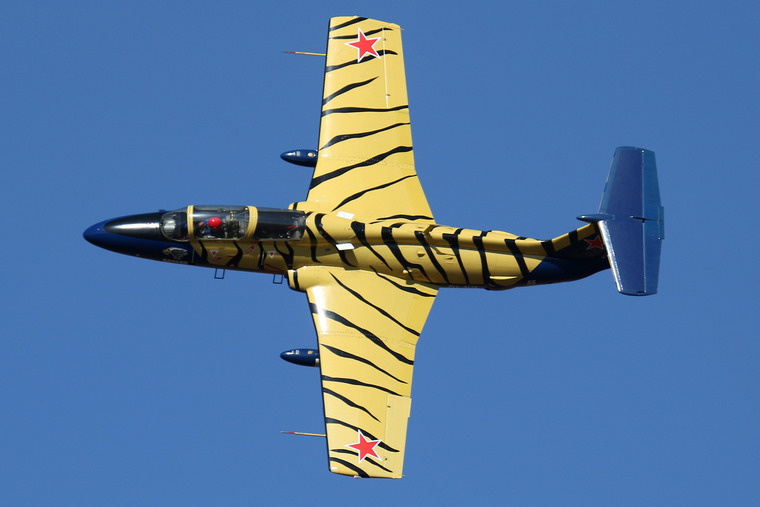 It still has the tiger stripes but is now part of the Eagles Aerobatic Team. Bringing a wealth of display experience, Glen gave a polished performance. The Delfin was followed by Ivan van der Schaar in his Boeing Stearman. Ivan's day job is flying British Airways' passengers around in Boeing 737 - 400 and 800 series aircraft. 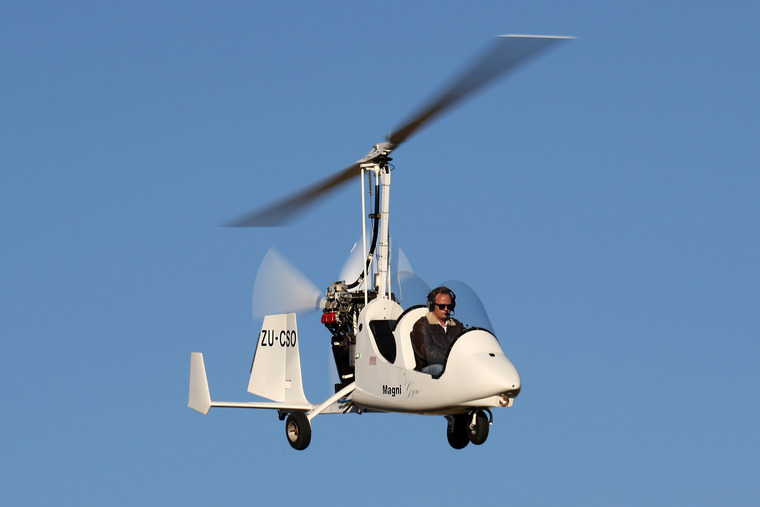 For fun, Ivan does aerobatics in his beautifully turned out machine. So, he goes from some of the newest Boeing equipment to one of the oldest and it is easy to see which one gives him greater pleasure! Next up were the Silver Falcons and it was a milestone event for them. This was the first air show performance of Team 82. It was also the first time Major Omphile Mutloane has led the team. He is the first person of colour to have had this honour. The team gave an immaculate four-ship display in Newcastle, this was quite an achievement for such a new combination. 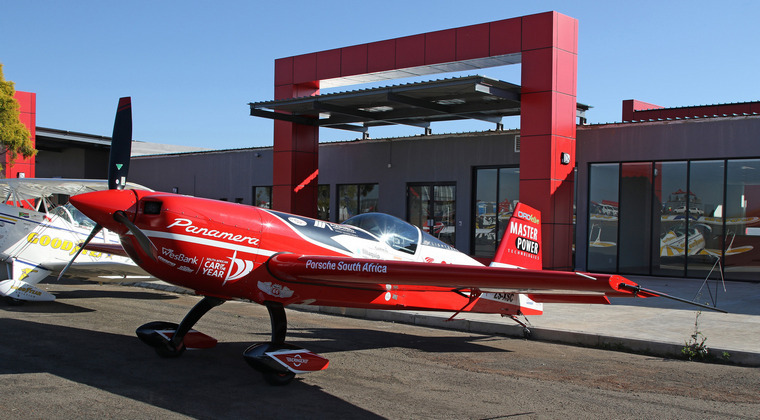 Falcon # 2 was flown by major Bheki Shabangu, # 3 was Major Corn� van Deventer and # 4 Sivuyile Tangana. This was the first display for Corn� but the others have many displays under their belts. 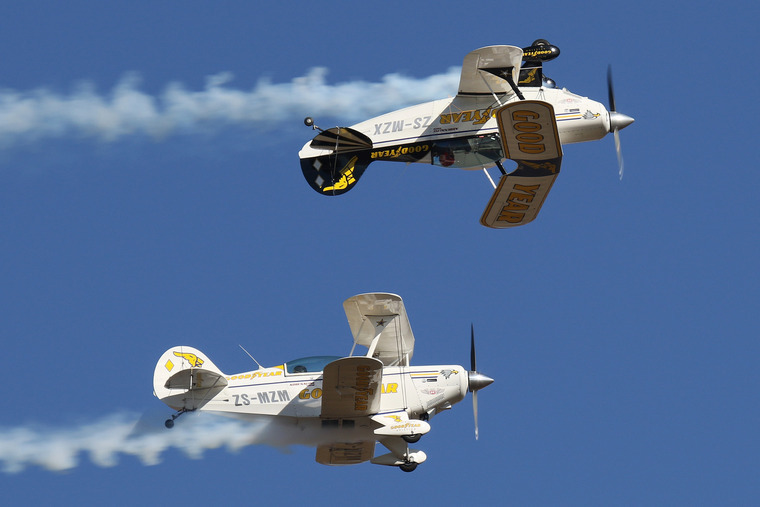 Omphile has flown 101 displays, Bheki has flown 43 and Sivuyile has flown a total of 95. Major Musa Dlamini, Falcon # 7 was the Ground Liaison Officer on the day and Alexander Albasini # 7 was the PRO. It is my understanding that the Falcons will revert to a five-ship team as soon as the selection process for a new member is completed. Apparently interviews and fly-offs are being done this week. 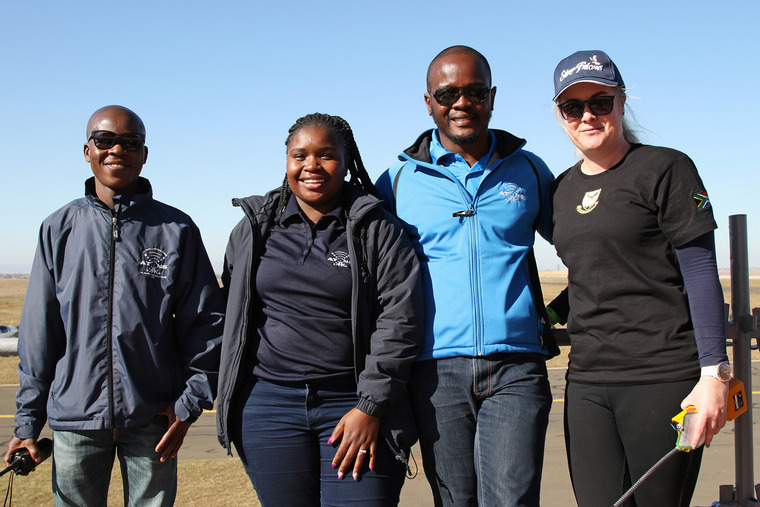 Once the new pilot is selected and trained, the team will reconfigure as follows: - Omphile will remain at # 1, the new person will slot in at # 2, Corn� will remain # 3, Bheki will move to # 4 and Sivuyile will be # 5 and also the soloist. Worth watching out for. 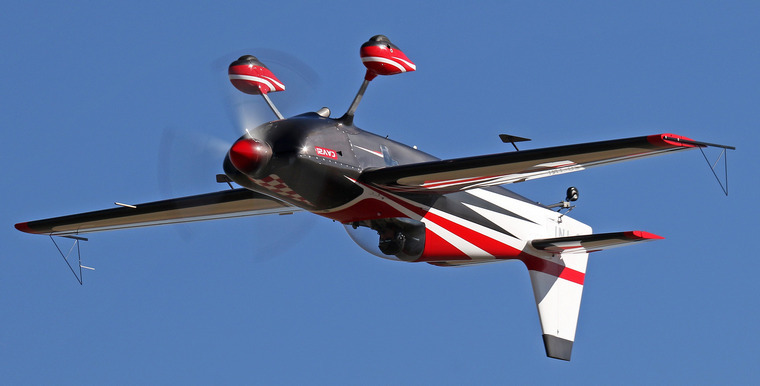 After the Falcons it was the turn of Neville Ferreira in his smart Slick 540 with its new colour scheme. 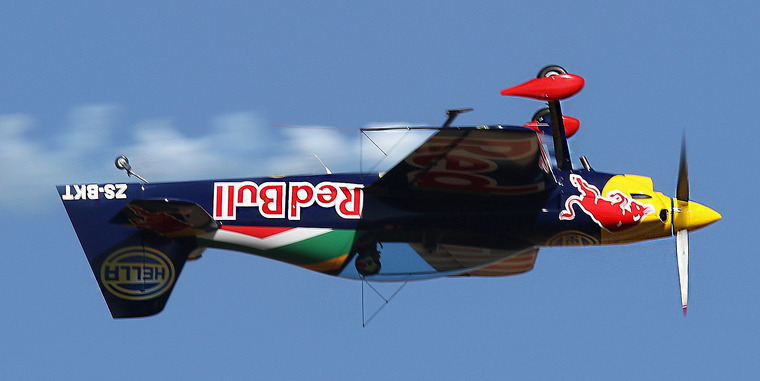 Neville is a very accomplished aerobatic and display pilot and he showed it by his high energy routine. 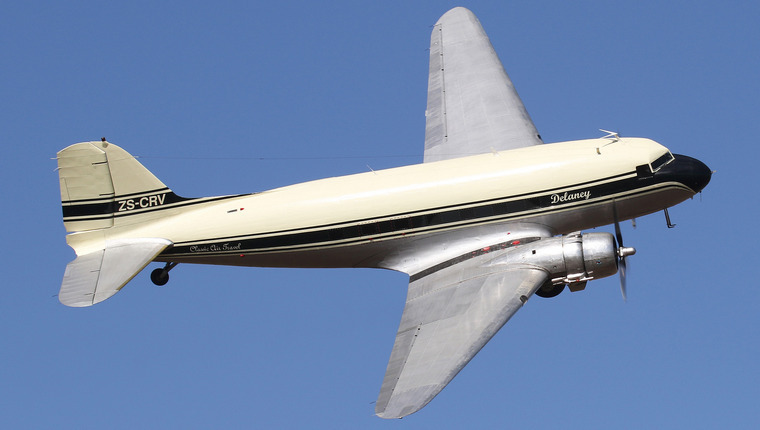 After this Derek Hopkins flew Menno Parson's immaculate Douglas DC-3. 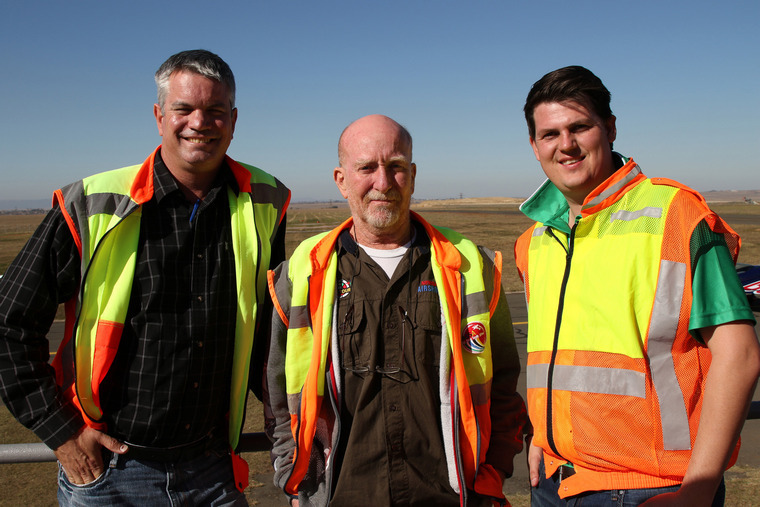 Accompanying Derek in the right-hand seat was former SAA 340 captain John McKerchar. It was a wonderful sight, seeing this gracious old lady showing off her beauty! Derek made several passes showing the top side and underneath as well as a low and slow pass with the gear extended. Then we had a display from the SAAF Agusta A-109E flown by Major Diaan Grobbelaar. The entertaining sequence, showed off this helicopter's handling capabilities and it manoeuvrability as well as the pilot's skills. 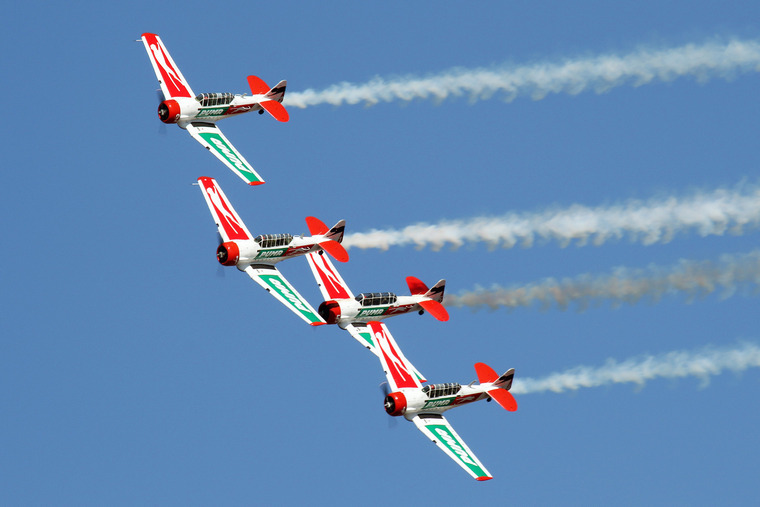 Team Xtreme then turned up the tempo with their world class energetic aerobatic display. 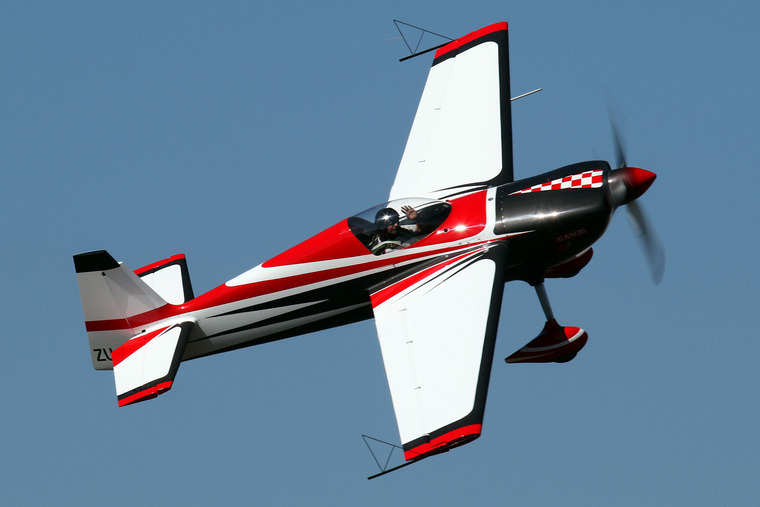 The show was flown by Nigel Hopkins in his Extra 330/SC and Mark Hensman who was flying Mark Sampson's yellow Xtreme Air XA41. 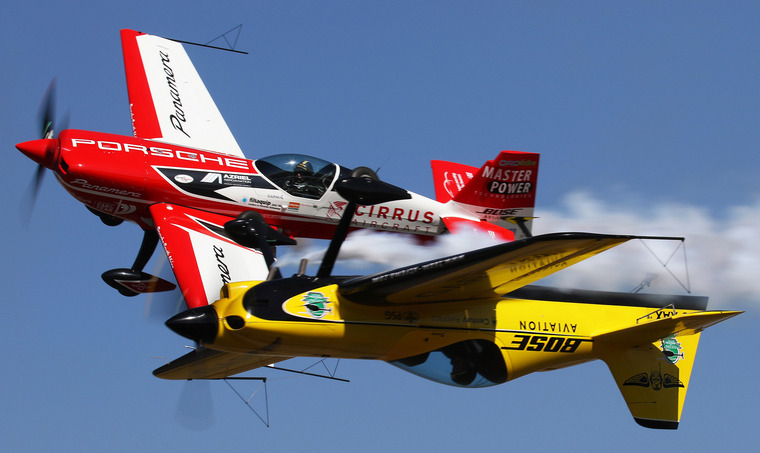 An amazing display of tight precision aerobatics by two of the best pilot's around. This was followed by another amazing pilot, Patrick Davidson from Port Elizabeth, flying his Red Bull liveried Xreme Air XA-42. 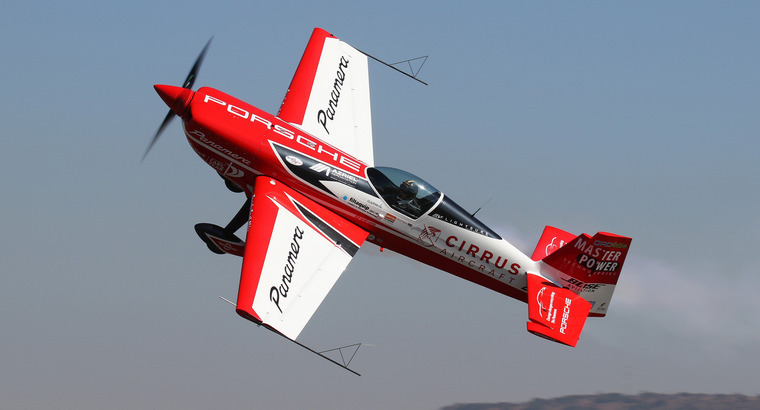 Patrick is now in the Red Bill Air Race Challenger Class representing South Africa. He is hoping to move up to the Master Class. In total 24 pilots fly in the series in 2018 so to make it into this elite group of the best of the best, says a whole lot about Patrick's skills. 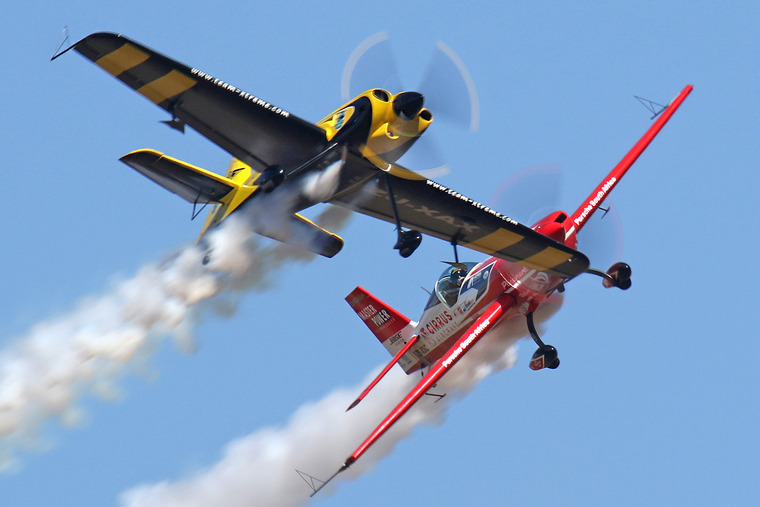 The Flying Lions are a fixture in air shows and always give a professional display with their Puma sponsored Harvards. These big radial engine work horses make lots of noise and with their smoke systems pumping the spectators lapped it up. The team is Scully Levin, Arnie Meneghelli, Ellis Levin and Shaun Thackwray. After the Lions it was the turn of the Goodyear Eagles in their Pitts Specials. This time it was a three-ship display flown by Nigel Hopkins, Glen Warden and Jason Beamish. The Pitts is built for aerobatics and as is the norm the team gave a thrilling show. The last to go in the morning session was the Magni Gyro of Matthew Zalewski. As he taxied out it the gyro had an apparent problem with a hydraulic line so the first display was aborted. The problem was soon attended to however and repairs were made quickly enabling Matthew to fly his afternoon slot. 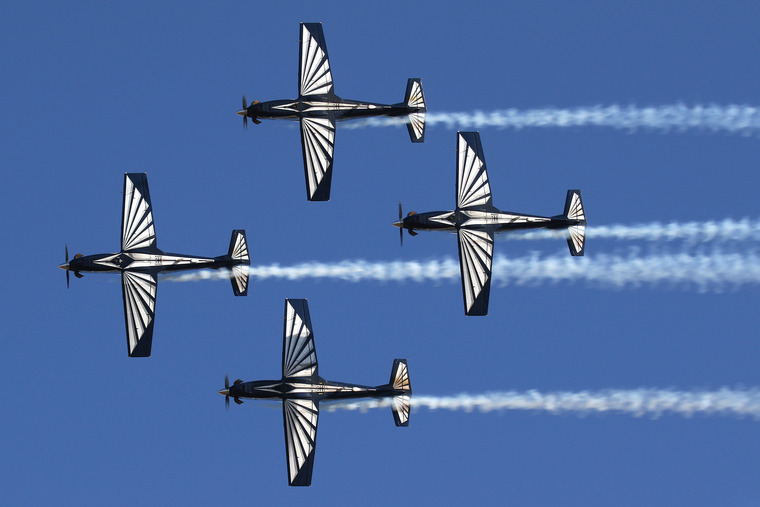 The morning program was then repeated in the afternoon, starting with the Silver Falcons. They were followed by a fly past of the SAAF Oryx. It had been working hard all day flying 100 local learners who were having the unforgettable experience of flying for the first time. Air Total, the main air show sponsor was determined to foster an interest in flying in the local community. 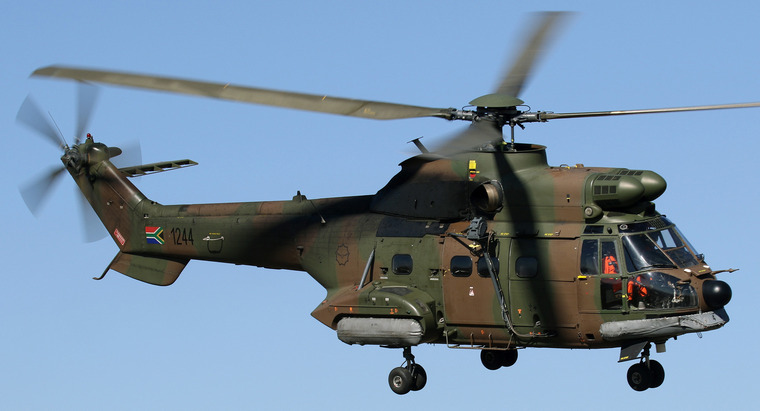 Grade 11 learners received talks from Denel, the CAA and the SAAF to illustrate career options available in aviation. 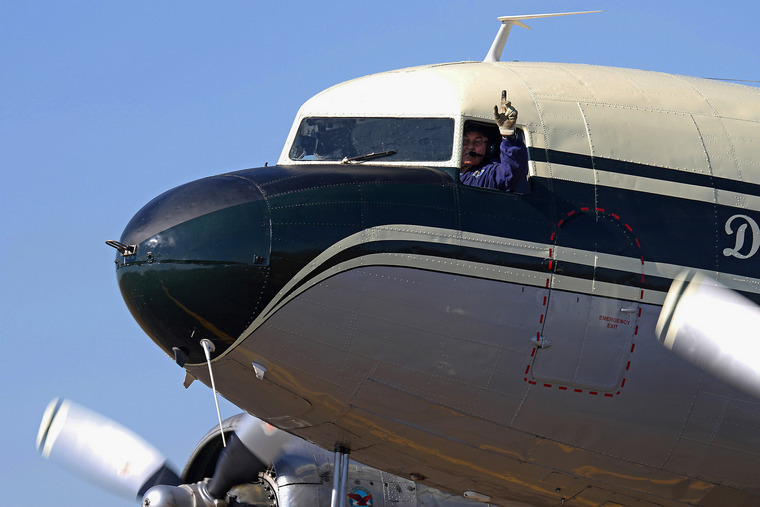 Then we had a real treat watching the two Team Xtreme aircraft formating on the DC-3. This was memorable due to the fact that Derek Hopkins was flying lead in the DC-3 and his son Nigel, was formating on the �old man's� wing. One to remember. 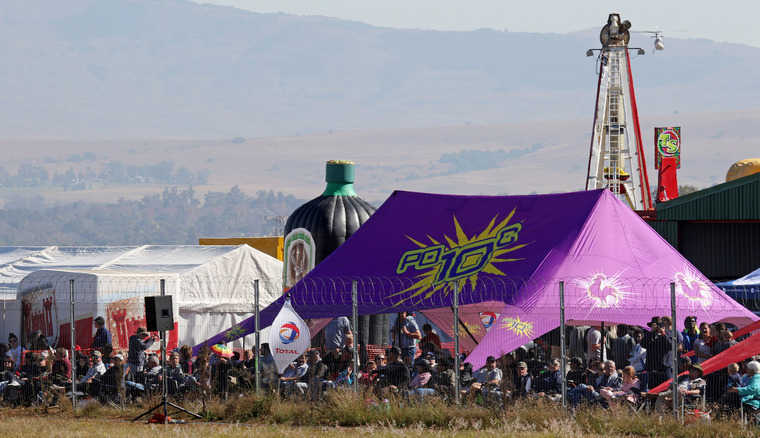 Another unique event in the afternoon was the race between Neville Ferreira in his Slick 540 against the Stucky Motors Mercedes CLA 45 driven by Fred van Dyk. Off the line the car was by far the quickest but by the end on the runway the Slick 540 had taken over. Then the turn cost Neville a lot of time having to haul back, climb and stall turn before charging down the runway again. This happened several times and in the end the car proved to be the faster and took the chequered flag. Neville made it quite exciting by making one pass, at fairly low level, inverted. Much fun was had by all. 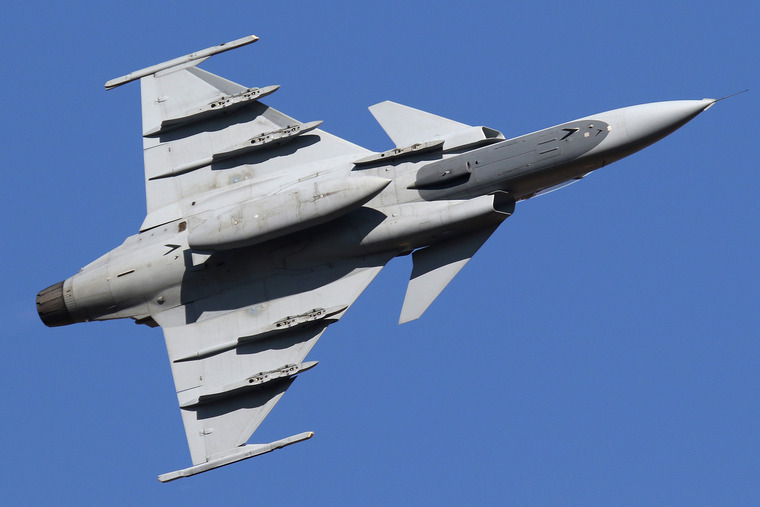 Second displays continued up until 3pm when, for many, the highlight of the day was the appearance SAAB Gripen of the South African Airforce. 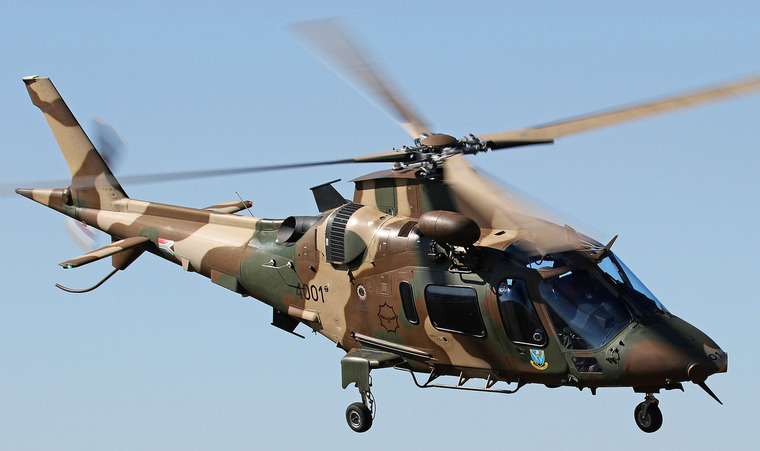 This aircraft flew from its base (AFB Makhado in Limpopo) by Lt. Col. Lee-Roy Goosen and Lt. Col. Johannes Mashaba. The pride of the air force made several passes including a high speed one and a 'dirty' configuration one with the landing gear out. Those present were wowed to see one of these state of the art machines at close quarters. After each team completed their second display (the Falcons did three!) 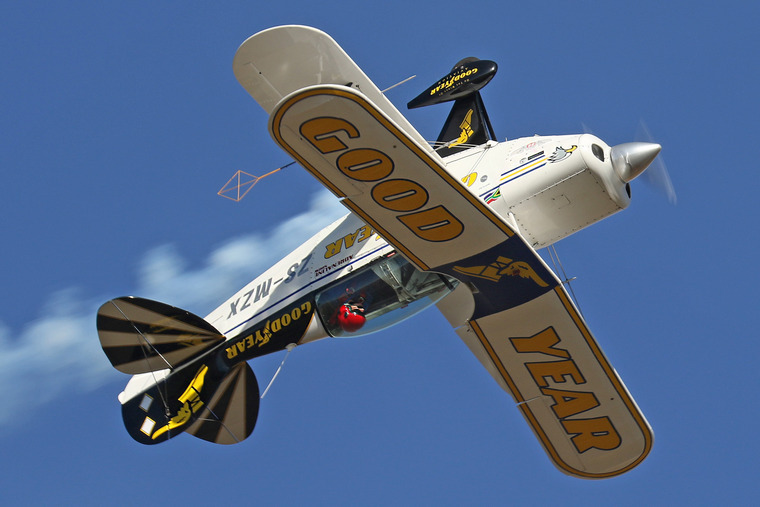 it was left to Ivan van der Schaar in the Stearman to close the show. After landing he proceeded to make a lot of smoke on the runway, so much so that his machine disappeared in it, in salute to the crowd. When arriving at the hard stand at the airport terminal he proceeded to do the same to the delight of most onlookers. With that, ended a very enjoyable, safe and well-run show that was blessed with wonderful weather. The hard work involved in such an event was all worth it. May the Newcastle Air Show go from strength to strength, roll on number nine!